Submission is not complete until all required data is collected and a reference number is received. When you are ready to proceed, enter your contact information and select the unit from the list below. Note: If you have a push button model used in a personal watercraft such as a JET SKI ©, be sure to select the personal watercraft option. If you believe that you have an aﬀected extinguisher installed in a motor vehicle (or RV), or are a motor vehicle (or RV) dealer, please select your unit from the list below. To complete the replacement process you will need to enter the VIN number of your vehicle. If you have additional questions, please call 1-800-880-6788. If submitting 13 or more units, please call 1.800.654.9677 and select option #2. Push Button Pindicator Water Craft (diagram) Note: Replacement color may vary from original model. Replacement model for water craft could be larger than existing model and may not fit in the same location. Is this fire extinguisher located in a motor vehicle (car, truck, RV or trailer)? 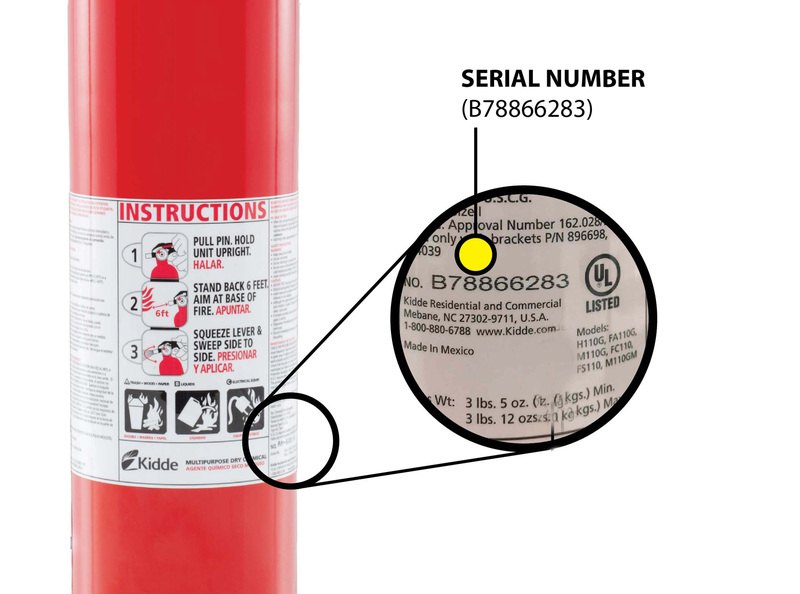 A: We are recalling certain Kidde fire extinguishers due to a potential safety issue. As consumer safety is our priority, we are working with the U.S. Consumer Product Safety Commission (CPSC) and other relevant authorities to notify customers with instructions for returning the affected models and how to replace them with different, unaffected models. Q: How can I find out if my fire extinguisher is included in the recall? A: Please contact us at (800) 880-6788 between 8:30 a.m. and 5 p.m. EST Monday-Friday (excluding holidays), or between 9 a.m. and 3 p.m. during the weekend to determine whether your extinguishers are affected. Alternatively, detailed information about which products are included is available below. A: Please contact us at (800) 880-6788 between 8:30 a.m. and 5 p.m. EST Monday-Friday (excluding holidays), or between 9 a.m. and 3 p.m. during the weekend to determine whether your extinguishers are affected. If it is determined that you do have an affected fire extinguisher, a replacement will be shipped within approximately 10 to 15 business days from this call. Please keep your affected unit until the replacement arrives. Please note, if your model is used with a personal watercraft, Kidde does not currently have an exact replacement for it, but is prepared to offer you a replacement extinguisher which is both US Coast Guard rated, and is similar in size. While it may not fit in the same location as the extinguisher that you currently have, there may be another space on your watercraft in which you can store this extinguisher. A: No proof of purchase is required. Please supply the model number, year of manufacture, the unit’s date code and serial number. Additional information may also be requested. You can find the model number and serial number on the unit’s label. A: Please retain your existing extinguisher(s) until your replacement(s) has been received. Upon receipt of your new fire extinguisher(s) you will find instructions for returning the recalled unit(s). Q: Which fire extinguishers are being recalled? A: This recall involves two styles of Kidde fire extinguishers: certain plastic handle fire extinguishers and push-button Pindicator fire extinguishers. 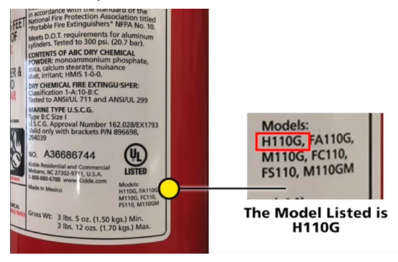 Plastic handle fire extinguishers: The recall involves 134 models of Kidde fire extinguishers manufactured between January 1, 1973 and August 15, 2017, including some models that were previously recalled in March 2009 and in February 2015. The extinguishers were sold in red, white and silver, and are either ABC- or BC-rated. 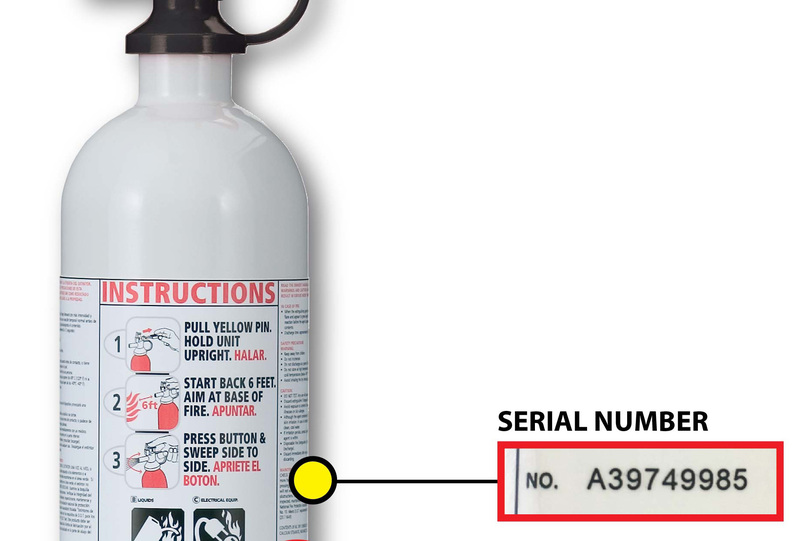 The model number is printed on the fire extinguisher label. For units produced in 2007 and beyond, the date of manufacture is a 10-digit date code printed on the side of the cylinder, near the bottom. Digits five through nine represent the day and year of manufacture in DDDYY format. Date codes for recalled models manufactured from January 2, 2012 through August 15, 2017 are 00212 through 22717. 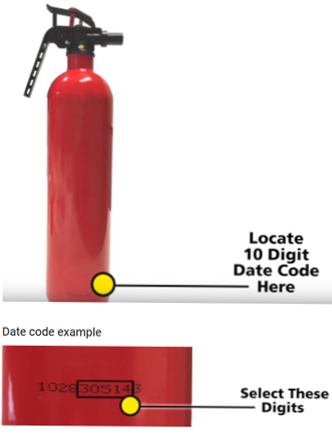 For units produced before 2007, a date code is not printed on the fire extinguisher.